This week’s list includes why change is like grief and how to manage it. letzNav Takeaway: Employees are more likely to adapt to new software when they’re properly trained and engaged. Self-service support and training tools, like letzNav, empower employees to learn and master new software on their own. While you may be excited about implementing new software, your employees could be terrified by the change. They may even go through the five steps of grieving: denial, anger, bargaining, depression and, finally, acceptance. Day-to-day life may not change much for leaders, but for front-line employees changing the software they’ve used for years is difficult. They feel like experts on the current system and don’t want to go back to feeling like novices. Change leaders will have to build alignment and trust to overcome grief-style resistance. letzNav Takeaway: In last week’s Change Management Weekly, we linked to new research showing that to successfully implement change you should focus on communicating what will stay the same. This article gives some examples of why that’s a good strategy - especially for people who are grieving the loss of an old system. letzNav Takeaway: You shouldn’t have to guess how your software implementation is going. You should be able to measure it. letzNav’s analytics give you the power to identify what’s going well and where employees could use additional support with new software. 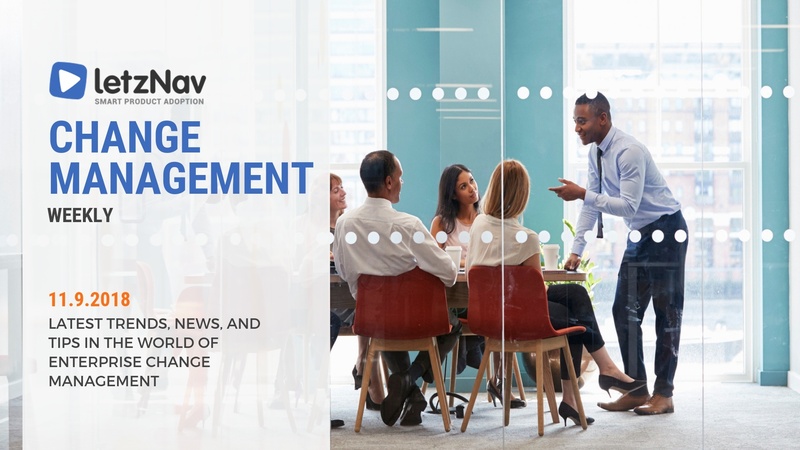 Change Management Weekly, letzNav’s summary of the latest trends, news, and tips in the world of enterprise change management, is published every Friday. To learn more about how letzNav innovative adoption tools can improve your change management initiative, schedule a demo today.